Background and Objective: Deficient knowledge on antibiotics causes misuse. This study aimed to investigate parents' knowledge, attitudes and practices on antibiotic use by children in various cities of Saudi Arabia. Methods: This cross-sectional study was carried out using a previously validated questionnaire. The questionnaire was translated into Arabic and hosted on Google Forms. Parents of children aged ≤14 years, whose contact details were available with the author, were contacted and requested to participate in the study. For those who agreed to participate, the Google Forms link was shared through WhatsApp between July and August 2016. The respondents were also encouraged to share the link with contacts who had children aged ≤14 years. Descriptive and inferential statistical analyses were performed. Results: In total, 544 parents responded from various cities of Saudi Arabia. Of these, about 75% were males (mean age = 49.9 years) and the majority (~68%) had a university degree and above. In the 6 months preceding the study, 431 respondents had taken their children to physicians. Of these, only 7.2% reported not being prescribed any antibiotics, whereas 66.8% were prescribed an oral antibiotic one or two times and 26% were more than three times. In terms of prescription, 373 respondents (68.6%) purchased antibiotics without a prescription, whereas 171 (31.4%) purchased it only after obtaining a prescription. However, only seven (1.3%) followed instructions regarding antibiotic usage, whereas 50% did not receive any advice from their doctor regarding use. All demographic characteristics, except gender and residence, were found to have significant effect on parents' knowledge on antibiotic use (P < 0.05). Conclusion: This study found that in various cities of Saudi Arabia, parents' knowledge, attitudes and practices on antibiotics for their children are poor. These findings highlight the need for parental education programs regarding antibiotic use and for implementing more stringent regulations on antibiotic prescription. About 26% of the population in Saudi Arabia are ≤14 years of age, and thus likely require care by their caregivers/parents during illnesses. In addition, parents are an integral part of the community. Accordingly, this study intended to determine the parents' knowledge, attitudes and practices (KAP) on antibiotic use by their children in different parts of Saudi Arabia. The findings of this study would provide data for stakeholders to better strategize interventional plans and implement necessary measures to reduce the impact of antibiotic misuse in Saudi Arabia. This cross-sectional descriptive study was carried out by adopting a questionnaire previously used to elicit data on KAP toward antibiotic use, after seeking permission from the author. The questionnaire was translated into Arabic and then back translated into English to validate the translation. The translated questionnaire was hosted on Google Forms. According to Belkina et al., in Saudi Arabia, the prevalence of nonprescription antibiotic usage is 48%. Accordingly, using the formula N = (where N: sample size; Z a: value for alpha error = 1.96; Z b: value for beta error = 0.84; : mean proportion = 0.48 and : mean proportion = 0.1), the minimum sample size was estimated as 204. The author had a database of parents from Saudi Arabia with children aged ≤14 years; these parents were contacted and requested to participate in the study. For those who agreed to participate, the Google Forms link was shared through WhatsApp, and they were also encouraged to share the link with their contacts who had children aged ≤14 years. Data were collected between July and August 2016. The author chose to distribute the questionnaire link through WhatsApp to obtain a broader geographical and demographical sample from Saudi Arabia. Return of the questionnaire was considered consent to participate in the study. A statement was added on the first page of the Google Form clearly informing the participants that all data collected would be strictly confidential, not be disclosed for any reason and only be used for research purposes. Any response indicating no children within the cutoff age limit was excluded from the data analysis. In addition to eliciting demographic characteristics, the questionnaire was divided into three main parts. Part A of the questionnaire elicited the parents' knowledge about antibiotics through questions on indications, side effects, use, when to initiate or stop antibiotic medication, etc., with three possible answers for each item (i.e., disagree, agree or uncertain). In addition, the respondents were asked to select names they recognized as antibiotics from a list of nine commonly used medications as well as state their sources for obtaining information on judicious use of antibiotics. Part B of the questionnaire studied attitudes of parents toward antimicrobial agents' use and the role of doctors. 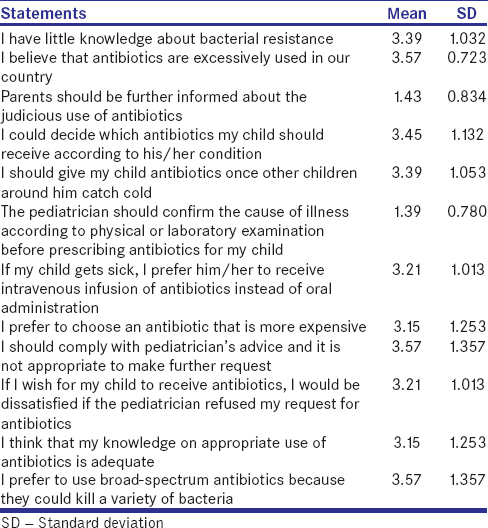 Data were elicited using a 5-point Likert scale (1 = strongly agree; 5 = strongly disagree) through questions pertaining to parents' expectations from antibiotic prescription, the effect of pricing on their selection of antibiotics and effect of misuse. Finally, Part C analyzed the caregivers' practices by extracting data on how frequently were antibiotics purchased only after obtaining a prescription from a doctor, how often they altered the dose given based on self-perception of the drug's safety and efficacy, how often they follow their doctor's instructions and advice as well as how often does their doctor explain their child's condition and management. Assuming an interval scale for Likert type, descriptive results for the quantitative variables were evaluated according to the mean (overall Likert scaling about mean: 1–1.79 = uncertain; 1.80–2.59 = strongly disagree; 2.60–3.39 = disagree; 3.40–4.19 = agree and 4.20–5 = strongly agree). Responses were recorded using a scale where 0 = never, 1 or 2 = occasionally, 3–6 = often, 7 or 8 = most of the time and 9 = always. Other questions included reasons for antibiotic use without medical advice (over-the-counter medications or leftover antibiotics), the easiest way to purchase antibiotics without prescriptions and the reasons for doing so. A multivariate analysis was performed using binary logistic regression. A forward stepwise selection technique was used to select the most significant variables to be included in the model. The Wald test was used to determine statistical significance for each independent variable. The significance level for variables to enter the logistic regression models was set at 0.2, and for removing them, it was set at 0.4. A two-sided P ≤ 0.05 indicated statistical significance. Descriptive and inferential statistical analyses were performed to examine and compare the responses obtained using SPSS version 23.0 for Windows (IBM Corp, Armonk, NY, USA). This study was approved by the Research Committee of College of Medicine, Najran University, on May 20, 2016. A total of 544 parents with children aged ≤14 years responded from various cities of Saudi Arabia [Table 1]. The characteristics of the respondents are summarized in [Table 2]. About three-quarters of the respondents were male (77.6%), and the mean age was 49.9 years (±8.98). The majority of fathers and mothers had at least completed high school (90.9% and 79.5%, respectively). Almost 68% and 52% of the fathers and mothers, respectively, were university graduates and above. Sixty-three percent of the participants had a middle-level income (i.e., SAR 5000–19,999 per month), and about 90% resided in cities. Of the total, only 38 (7%) respondents were non-Saudis. A discrepancy regarding parental knowledge about antibiotics was observed. A total of 176 parents responded correctly to questions regarding antibiotics not being anti-inflammatory medications, 210 parents responded that antibiotics should not be used for viral infections and 397 stated that it should not be administered in any case of fever. Further, 344 parents agreed that the prescribed course should be completed even if fever subsides before the end of the course, 233 agreed that the antibiotic price does not reflect its efficacy and 455 agreed that antibiotics should not necessarily be used in any case of upper respiratory tract infections. In addition, 457 parents responded that there is a relationship between antibiotic misuse and bacterial resistance against it and 400 agreed that such increasing resistance is dangerous for their child's health. Three hundred and fifty-four disagreed using antibiotics for treating common cold, 433 agreed that using multiple antibiotics is not more effective than single antibiotics in treating common infections and 451 disagreed that taking antibiotics in advance can protect against common cold. On the other hand, 446 parents responded incorrectly to questions regarding the side effects of antibiotics, whereas 156 agreed with the statement that it is easy for researchers to develop new antibiotics. Amoxicillin, amoxicillin–clavulanate, azithromycin, cephradine and cefuroxime were not considered to be antibiotics by 30.3%, 32.2%, 57.7%, 86.0% and 74.3% of the parents, respectively. Further, Histop (antihistamine), aspirin, acetaminophen and ibuprofen were considered to be antibiotics by 11.2%, 6.3%, 8.1% and 16.7%, respectively. A total of 452 (83%) respondents reported that physicians are their main source of information on judicious use of antibiotics, followed by pharmacists, friends and family member or relatives. The logistic regression to test the effect of the demographic characteristics on participants' knowledge toward antibiotic use showed that all parameters have a significant effect (P < 0.05), except for gender (P < 0.186) and residence (P < 0.729). 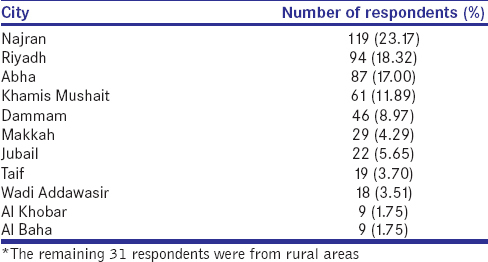 [Table 3] shows the results of the parents' attitude toward the use of antibiotics reflected through their knowledge. The respondents were found to have a correct attitude toward items 5 and 7–11 and an incorrect attitude toward items 1–4, 6 and 12. Logistic regression to test the effect of the demographic characteristics on participants' attitude toward antibiotic use showed that all parameters have a nonsignificant effect [Table 4]. In total, 431 (79%) respondents visited a doctor for their children at least once in the 6 months preceding the study, mainly owing to fever, sore throat and cough [Table 5]; of these, 281 had two or more visits. However, only 7.2% reported not being prescribed any antibiotics, whereas 66.8% were prescribed an oral antibiotic one or two times and 26% were prescribed antibiotics more than three times. A total of 379 (~69.7%) respondents stated that their children received intravenous antibiotics in the past 6 months, of which 160 (~42%) received it more than once but ≤3 times. Further, 373 respondents (68.6%) purchased antibiotics without a prescription, with a local pharmacy being their main source [Figure 1]. Time constraint, not considering their child's condition to be serious and using leftover antibiotics or considering obtaining antibiotic directly from a pharmacist to be easier were the most common reasons for purchasing antibiotics without a physician's prescription. Nevertheless, 171 (31.4%) parents always obtained prescription for antibiotics from their doctor for purchasing antibiotics, but only 7 (1.3%) followed their instructions. Almost 80% of the parents were found to under- or overdose their children based on their perception of the drug's safety or efficacy, respectively. Three hundred and fifty-nine (66%) parents stored antibiotics for future use, while 50% reported that they did not receive any advice from their doctor toward the use of antibiotics. The current study found that parents, the primary caregivers of children, do recognize their knowledge on antibiotic use as being inadequate [Table 3]. Therefore, campaigns should be carried out to increase awareness on antibiotics use among the general population, especially among caregivers such as parents. In Saudi Arabia, Al Rasheed et al. recommend distribution of brochures with information on the negative impact of self-prescribing antibiotics as well as establishment of local evidence-based guidelines on antibiotic use to improve public awareness. Previously, in England, poster campaigns alone did not improve knowledge on antibiotic use., In Portugal, teaching activity regarding antibiotic misuse was found to significantly increase the knowledge of middle-aged students. Therefore, improving antibiotic-prescribing practice requires a continuous and collaborative approach between all stakeholders including health-care personnel and the general population, especially caregivers such as parents. The majority (83%) of the respondents reported that their physician was the most common source of information regarding antibiotics, followed by pharmacists (63%), which is similar to that previously reported in other countries., Further, similar to the findings in other countries, the majority of the respondents purchased antibiotics without prescription, mainly from their local pharmacy.,,,, Such attitude is likely because the parents may not consider their child's condition to be serious in addition to the lack of time to visit a clinic. Nonetheless, such attitudes would likely be counteracted partially based on the stricter implementation of regulations in Saudi Arabia, wherein sale of antibiotics without prescription by pharmacists would result in heavy penalty and actions. Similarly, physicians' knowledge on antibiotic prescription should be enhanced through symposia, campaigns and providing infectious disease services in each health-care facility. The estimated self-medication rate in this study was higher than most reported rates in Saudi Arabia (22%),,, as well as in the United Kingdom (5%), Turkey (19%) and Lebanon (22%), but lower than that reported in Italy (32%), Spain (41%), Poland (41%), Romania (44%) and Greece (44%). This variation is mostly due to differences in the implementation of regulation on antibiotic prescription and sale in these countries. Collectively, the findings of this study indicate the need for policymakers to enforce a more strict supervision on antibiotic sale. Unsurprisingly, this study found that parents are less anxious when their child is prescribed an antibiotic. Such perception of the parents is likely because of overprescription of antibiotics by physicians. Further, although 171 (31.4%) respondents always obtained prescription for antibiotics from their doctor, only 1.3% followed their doctor's advice, whereas 80% underdosed their children in consideration of safety. This is compounded by the lack of explanation provided by the physician to parents (about 50%) when antibiotics are prescribed, likely leading to the low knowledge observed in the current study (mean Likert scale score = 1.43). Therefore, the study findings highlight that physicians need to exercise caution when prescribing antibiotics and that they should spend more time with parents to impart knowledge regarding the proper use of antibiotics. In this study, data were collected from parents through a web-based questionnaire sent through WhatsApp to obtain response from different parts of Saudi Arabia and different nationalities. The author chose this method over the direct interview method to avoid influencing the parents' response during conversation or reducing the quality of response due to the responders' embarrassment. In addition, variability among interviewers could not have been excluded. On the other hand, using the chosen method, each responder received the same set of questions, and thus the answers were derived in a more objective way than through an interview. The current study had a relatively small sample size and was unable to cover all the major cities of Saudi Arabia, and thus the study findings may not be completely representative of the entire population of parents in Saudi Arabia with children aged ≤14 years. Further, most respondents in this study were from urban areas, likely because the mode of questionnaire distribution and collection required an internet connection, which may not have been widely available in rural areas. Therefore, the findings of this study is likely more representative of the urban population of various cities of Saudi Arabia. Accordingly, the author recommends conducting large-scale studies in specific regions and proportionately including both urban and rural populations for better representativeness. As this was a self-administered questionnaire study, recall bias regarding the use of antibiotics over the 6 months preceding the study, subjectivity and interpretation of questions may result in parents' knowledge, attitude and practices not necessarily reflecting their actual behavior. The study had a higher proportion of male respondents, and thus future studies with a more balanced viewpoint of fathers and mothers may provide better insight. Lastly, the older age of the parents and subjective appreciation of the medical terms such as antibiotic name or disease symptom may have influenced their responses. The study findings indicate that in various cities of Saudi Arabia, parents' knowledge, attitudes and practices on antibiotic use by their children are poor. Further, majority of parents purchased antibiotics without prescription from local pharmacies, and those who did obtain it through prescription, rarely followed the instructions of their doctor regarding its use. The findings of this study highlight the need for parental education programs regarding antibiotic use as well as the need for implementing more stringent regulations on antibiotic prescription by physicians, as has recently been done for sale of antibiotics with prescription on pharmacies. Moreover, academic institutions in Saudi Arabia must provide health-care professionals with rational antibiotic knowledge and enhance their patient consultation skills. Vaz LE, Kleinman KP, Lakoma MD, Dutta-Linn MM, Nahill C, Hellinger J, et al. Prevalence of parental misconceptions about antibiotic use. Pediatrics 2015;136:221-31. Pechère JC. Patients' interviews and misuse of antibiotics. Clin Infect Dis 2001;33 Suppl 3:S170-3. Cebotarenco N, Bush PJ. Reducing antibiotics for colds and flu: A student-taught program. Health Educ Res 2008;23:146-57. Belkina T, Al Warafi A, Hussein Eltom E, Tadjieva N, Kubena A, Vlcek J, et al. Antibiotic use and knowledge in the community of Yemen, Saudi Arabia, and Uzbekistan. J Infect Dev Ctries 2014;8:424-9. Bin Nafisah S, Bin Nafesa S, Alamery AH, Alhumaid MA, AlMuhaidib HM, Al-Eidan FA, et al. Over-the-counter antibiotics in Saudi Arabia, an urgent call for policy makers. J Infect Public Health 2017;10:522-6. Zowawi HM. Antimicrobial resistance in Saudi Arabia. An urgent call for an immediate action. Saudi Med J 2016;37:935-40. Alumran A, Hurst C, Hou XY. Antibiotics overuse in children with upper respiratory tract infections in Saudi Arabia: risk factors and potential interventions. Clin Med Diagn 2011;1:8-16. Levy Hara G, Kanj SS, Pagani L, Abbo L, Endimiani A, Wertheim HF, et al. Ten key points for the appropriate use of antibiotics in hospitalised patients: A consensus from the Antimicrobial Stewardship and Resistance Working Groups of the International Society of Chemotherapy. Int J Antimicrob Agents 2016;48:239-46. Department of Economic and Social Affairs. Population Division. World Population Prospects: The Revision. United Nations: Department of Economic and Social Affairs; 2017. Al-Dosari K. Parental KAP towards Antibiotics use in URT infection in children. Majmaah J Health Sci 2013;1:39-51. Baadani AM, Baig K, Alfahad WA, Aldalbahi S, Omrani AS. Physicians' knowledge, perceptions, and attitudes toward antimicrobial prescribing in Riyadh, Saudi Arabia. Saudi Med J 2015;36:613-9. Alhomoud F, Aljamea Z, Almahasnah R, Alkhalifah K, Basalelah L, Alhomoud FK, et al. Self-medication and self-prescription with antibiotics in the middle east-do they really happen? A systematic review of the prevalence, possible reasons, and outcomes. Int J Infect Dis 2017;57:3-12. Pavydė E, Veikutis V, Mačiulienė A, Mačiulis V, Petrikonis K, Stankevičius E, et al. Public knowledge, beliefs and behavior on antibiotic use and self-medication in Lithuania. Int J Environ Res Public Health 2015;12:7002-16. Alrafiaah AS, Alqarny MH, Alkubedan HY, AlQueflie S, Omair A. Are the Saudi parents aware of antibiotic role in upper respiratory tract infections in children? J Infect Public Health 2017;10:579-85. Al Rasheed A, Yagoub U, Alkhashan H, Abdelhay O, Alawwad A, Al Aboud A, et al. Prevalence and predictors of self-medication with antibiotics in al Wazarat health center, Riyadh city, KSA. Biomed Res Int 2016;2016:3916874. McNulty CA, Cookson BD, Lewis MA. Education of healthcare professionals and the public. J Antimicrob Chemother 2012;67:11-8. McNulty CA, Nichols T, Boyle PJ, Woodhead M, Davey P. The English antibiotic awareness campaigns: Did they change the public's knowledge of and attitudes to antibiotic use? J Antimicrob Chemother 2010;65:1526-33. Azevedo MM, Pinheiro C, Yaphe J, Baltazar F. Assessing the impact of a school intervention to promote students' knowledge and practices on correct antibiotic use. Int J Environ Res Public Health 2013;10:2920-31. Cals JW, Boumans D, Lardinois RJ, Gonzales R, Hopstaken RM, Butler CC, et al. Public beliefs on antibiotics and respiratory tract infections: An internet-based questionnaire study. Br J Gen Pract 2007;57:942-7. Panagakou SG, Spyridis N, Papaevangelou V, Theodoridou KM, Goutziana GP, Theodoridou MN, et al. 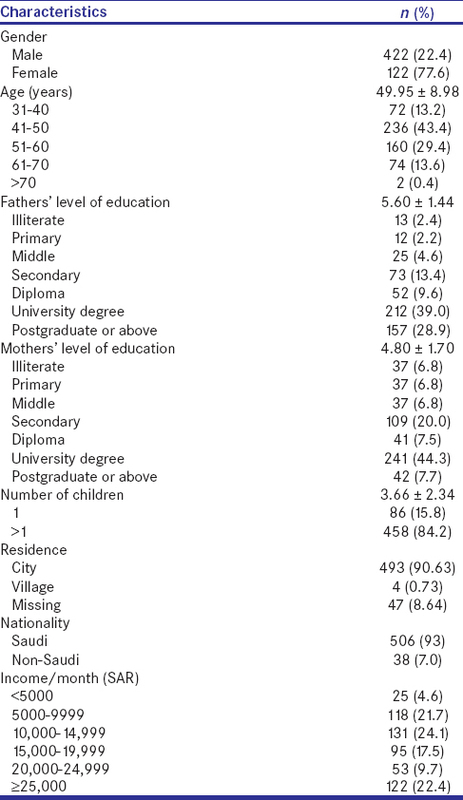 Antibiotic use for upper respiratory tract infections in children: A cross-sectional survey of knowledge, attitudes, and practices (KAP) of parents in Greece. BMC Pediatr 2011;11:60. Awad A, Eltayeb I, Matowe L, Thalib L. Self-medication with antibiotics and antimalarials in the community of Khartoum state, Sudan. J Pharm Pharm Sci 2005;8:326-31. Al-Azzam SI, Al-Husein BA, Alzoubi F, Masadeh MM, Al-Horani MA. 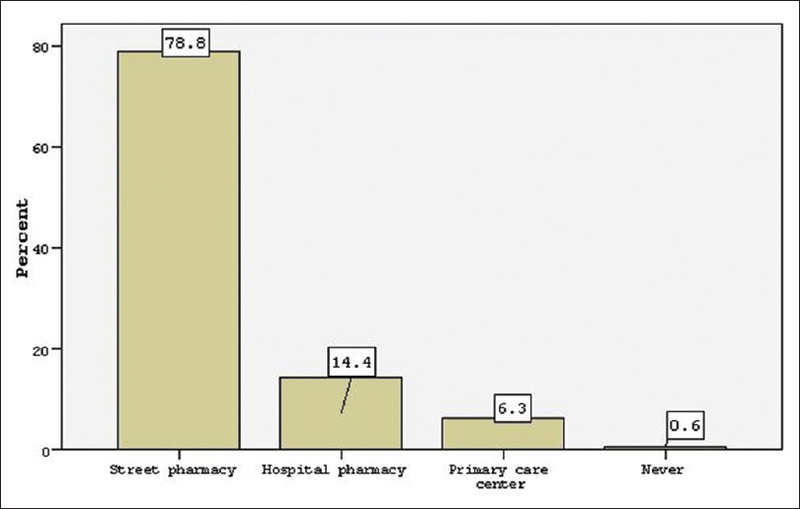 Self-medication with antibiotics in Jordanian population. Int J Occup Med Environ Health 2007;20:373-80. Widayati A, Suryawati S, de Crespigny C, Hiller JE. Self medication with antibiotics in Yogyakarta city Indonesia: A cross sectional population-based survey. BMC Res Notes 2011;4:491. MOH News. MOH Launches a Campaign to Supervise Dispensing of Non-Prescribed Antibiotics. Available from: https://www.moh.gov.sa/en/Ministry/MediaCenter/News/Pages/news-2018-05-06-001.aspx. [Last accessed on 2019 Jan 10]. Elbur AI, Albarraq AA, Abdallah MA. Saudi parents' knowledge, attitudes and practices on antibiotic use for upper respiratory tract infections in children: A population – Based survey; Taif, Kingdom of Saudi Arabia. JMR 2016;2:99-103. Aljadhey H, Assiri GA, Mahmoud MA, Al-Aqeel S, Murray M. Self-medication in central Saudi Arabia. Community pharmacy consumers' perspectives. Saudi Med J 2015;36:328-34. McNulty CA, Boyle P, Nichols T, Clappison P, Davey P. Don't wear me out – The public's knowledge of and attitudes to antibiotic use. J Antimicrob Chemother 2007;59:727-38. Ilhan MN, Durukan E, Ilhan SO, Aksakal FN, Ozkan S, Bumin MA, et al. Self-medication with antibiotics: Questionnaire survey among primary care center attendants. Pharmacoepidemiol Drug Saf 2009;18:1150-7. Mouhieddine TH, Olleik Z, Itani MM, Kawtharani S, Nassar H, Hassoun R, et al. Assessing the Lebanese population for their knowledge, attitudes and practices of antibiotic usage. J Infect Public Health 2015;8:20-31. Napolitano F, Izzo MT, Di Giuseppe G, Angelillo IF. Public knowledge, attitudes, and experience regarding the use of antibiotics in Italy. PLoS One 2013;8:e84177. Väänänen MH, Pietilä K, Airaksinen M. Self-medication with antibiotics – Does it really happen in Europe? Health Policy 2006;77:166-71. Muras M, Krajewski J, Nocun M, Godycki-Cwirko M. A survey of patient behaviours and beliefs regarding antibiotic self-medication for respiratory tract infections in Poland. Arch Med Sci 2013;9:854-7. Damian L, Lupuşoru CE, Ghiciuc CM. Self-medication with antimicrobial drugs among university students in a northeast region of Romania. Rev Med Chir Soc Med Nat Iasi 2014;118:160-4. Skliros E, Merkouris P, Papazafiropoulou A, Gikas A, Matzouranis G, Papafragos C, et al. Self-medication with antibiotics in rural population in Greece: A cross-sectional multicenter study. BMC Fam Pract 2010;11:58. Key JP. Questionnaire and Interview as Data – Gathering Tools; Oklahoma State University: Stillwater, OK, USA. Available from: http://www.okstate.edu/ag/agedcm4h/academic/aged5980a/5980/newpage16.htm [Last accessed on 2018 Dec 10].